As excited as I am that it is finally getting to be spring, I am totally not ready to give up on soup season yet. Especially when it's a delicious, super easy, cook-all-day-in-the-crockpot kind of soup. 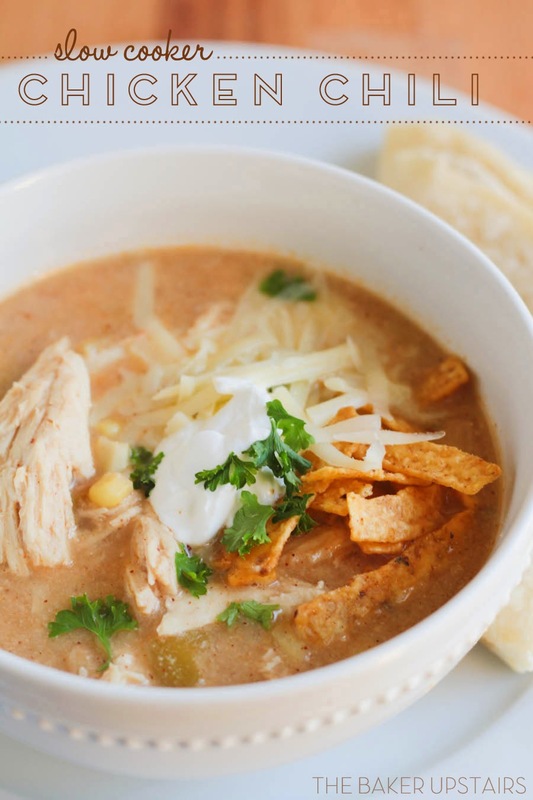 This slow cooker chicken chili is so flavorful, and really easy to make, too! My whole family loved this and my little girls each finished their serving (which, granted, was about 1/2 cup of chili, but I’m totally counting it as a victory). The recipe made a lot more than my little family can eat, so I froze the extra in individual size containers, and I’ve been taking it to work for an easy and healthy lunch. I served it with some of my favorite homemade tortillas, and it was a match made in heaven. Yum! Can’t wait to make this delicious chili again! Place the chicken breasts in the crockpot. Add the chili powder, cumin, garlic powder, chicken broth, green chiles, beans, and corn. Cook on low for 6-8 hours. About one hour before the chili is done, melt the butter in a medium saucepan over medium heat. Whisk in the flour to form a paste. Cook 2-3 minutes or until slightly golden. Whisking constantly to prevent lumps, slowly add the milk and the water/chicken base mixture. Continue to cook until thickened, then add the salt and pepper. Pour the mixture into the slow cooker and stir to combine. Add the sour cream and stir until combined. Pull out the chicken breasts and shred them with two forks to desired size, then return to the slow cooker. Let cook for another hour. Serve with toppings of your choice, and enjoy! Hi Alicia.... 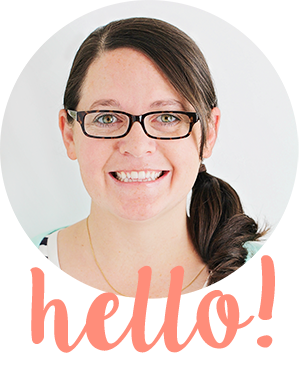 I just found your blog via pinterest!! :) I'm so excited!! I found so many recipes I want to try. 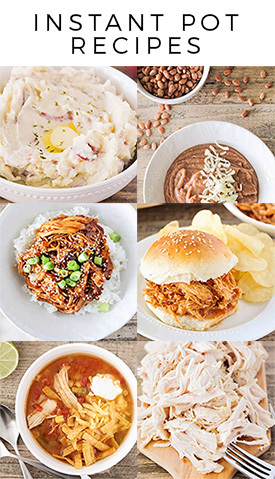 I cook for 100+ students and I'm always looking for tried and true recipes! Thank you for sharing your creative cooking ideas. 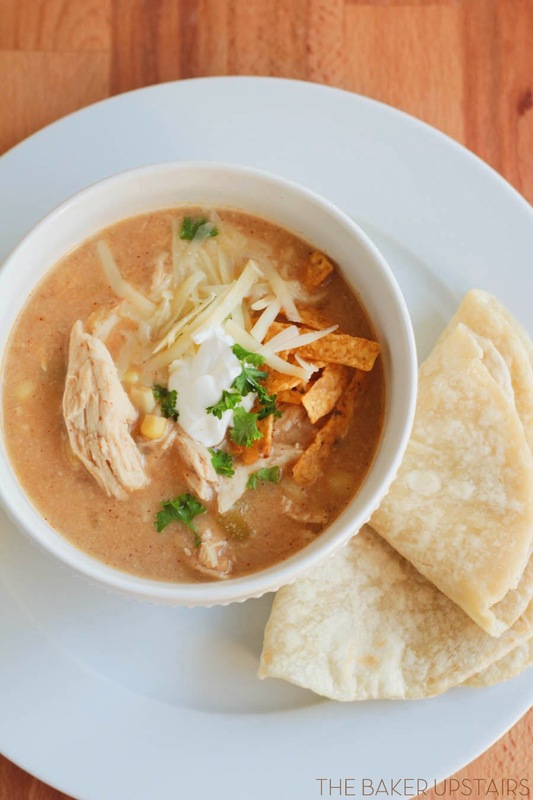 I love white chicken chili and cant wait to give this a try.